As Chicagoan Wish Kid Melinda Ortega grew, so did her passion for gymnastics, training 25 hours a week and dreaming of one day being an Olympian in the trapeze. Unfortunately, that all came to a stop when she was diagnosed with juvenile dermatomyositis (JDM), an inflammatory disease of the muscle, skin and blood vessels that affects about 3 in 1 million children each year. Children with JDM develop weakness in the large muscles around the neck, shoulders and hips. This causes difficulty in climbing stairs, getting into cars, getting up from a chair or off the floor, or brushing hair. Melinda now takes nine medications a day and attends around seven medical appointments each week. But you can’t get this sweet, friendly girl down. She really enjoys following the U.S. women’s gymnastics team and dreams of one day returning to gymnastics herself. Kids Wish Network wanted to give Melinda her dream and send her to Kellogg’s Tour of Gymnastics Champions, so she could meet and spend time with some of her favorite, and the world’s best women gymnasts. Many generous donors and sponsors including, the world renowned USA Gymnastics organization worked with Kids Wish Network to make Melinda’s dream a reality. 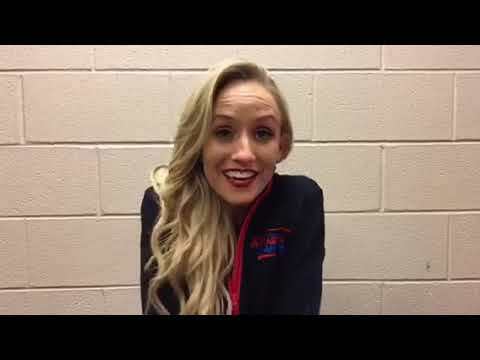 It all started when the wish was revealed to Melinda by world-renowned gold medal gymnast Nastia Liukin, who created a video clip telling Melinda her wish was being granted by Kids Wish Network. “My teammates and friends, we cannot wait to see you,” Liukin said in the video. “We can’t wait for you to see the show, too.” It was truly a special way for Melinda to find out she would be meeting members of the Gold Medal Women’s Gymnastic Olympic Team at an upcoming Kellogg’s Tour of Gymnastic Champions event in Philadelphia, Pennsylvania. The reveal for Melinda’s wish was quite the event with great sponsors donating food and treats to make it extra special for her. Pizza was donated by the famous Giordano’s Pizzeria, Jewel Osco donated scrumptious sub-sandwiches, and the frozen treat palace that goes by Dairy Queen donated a cake. It got even better for Melinda once the day of her wish arrived. Melinda will always remember the day when her very own private limo from Global Limousines picked her up at the luxurious Ritz Carlton of Philadelphia and took her to an amazing and upscale lunch provided by The Capital Grille of Philadelphia. From there, it was on to the Wells Fargo Center to meet some of her favorite gymnasts at the action packed Kellogg’s Tour of Gymnastics Champions event. For this part of the tour event, Olympic Gold Medalists Simone Biles, Aly Raisman, and Shawn Johnson were there for Melinda to meet and spend some time with. The four Olympian gymnasts made Melinda’s day even more memorable when they all posed for a photo. In addition to meeting her gymnast idols at the Kellogg’s event, Melinda and her family were also treated to relaxing full spa services at The Ritz Carlton’s Richel D’Ambra Spa & Salon. The family was chauffeured around town in a snazzy limo compliments of All American Limousines and had a wonderful meal courtesy of The Ritz Carlton’s upscale and delicious AQIMERO Restaurant.